The Chicago Police Department on Sunday released body camera footage depicting the fatal shooting of a man by a police officer in the South Shore neighborhood, less than 24 hours after the incident and violent skirmishes between law enforcement and protesters who gathered at the scene. In a preliminary statement, the department said officers approached 37-year-old Harith Augustus at about 5:30 p.m. Saturday near the 2000 block of East 71st Street after he “exhibit(ed) characteristics of an armed person.” Police said an “armed conflict” ensued and an officer fired his weapon, striking and killing Augustus. Warning: Graphic video. Note: This video does not include sound “due to video buffering,” CPD says. The video, which has no audio, appears to show four officers approaching Augustus on a sidewalk. Augustus backs off and spins away from officers before running into the street, at which point the video freezes to show what appears to be a firearm holstered on Augustus’ right side. According to his Facebook page, Augustus worked as a barber and previously studied at Kennedy-King College. He had no recent arrests and was not a known gang member, according to police. The department has identified the officer who fired his weapon only as a male who has completed his field training, but is still under the department’s probationary period for new hires. The video released to the public was taken from his body camera, though Johnson said there is far more footage of the incident that has not yet been released. The Civilian Office of Police Accountability (COPA) is currently investigating the shooting and the officer involved will be placed on routine administrative duty for 30 days. COPA Chief Administrator Sydney Roberts issued a statement Sunday afternoon calling on anyone with relevant information to contact her office. “I understand and empathize with the community’s concerns and want to assure the public that we are committed to conducting a fair, thorough, impartial and objective investigation,” she said. 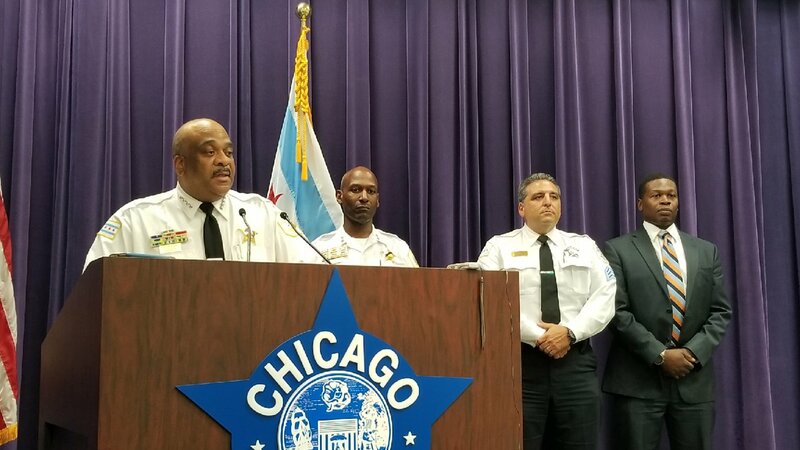 The department made the decision to publish the video “in the interest of transparency” and to dispel “inaccurate information,” according to CPD spokesman Anthony Guglielmi. Johnson took questions for about 15 minutes during a press conference Sunday in which he called the incident a “tragic loss of life" and said he decided to release the video only after consulting with COPA, community members and the Augustus family. Members of Augustus’ family, including his mother and step-father, were shown the video before it was released to the public. A weapon was recovered at the scene and no officers were injured at the time. But after the shooting, large groups of protesters gathered nearby. Police say some of these people threw rocks and bottles (some filled with urine), which injured four officers, according to Guglielmi. One man was arrested and is facing three felony battery counts. Three others were detained and later released without arrest or charge. At the press conference Sunday, Johnson said “this was probably the quickest” the department has released footage of an officer-involved shooting. In the case of Laquan McDonald, a Chicago teen shot and killed in 2014 by Chicago police Officer Jason Van Dyke, it took the department more than a year to release dashcam footage of the incident. Johnson compared this situation to the 2016 shooting of Paul O’Neal, in which the CPD released body camera footage within about one week. Further protests were planned Sunday evening. When asked what he would say to those upset by the shooting, Johnson said "calm down"
Are Chicago Murders All Gang-Related?